Tamper, theft, and damage resistant; smart, anodized aluminum pen attached to slim, matching aluminum base with nylon coated aircraft cable or retractable telephone type flexible coil. Cable cannot be severed with ordinary tools. Affixes to counter with tough, double-coated adhesive. Supplied with extra capacity Jumbo Jogger Refills. 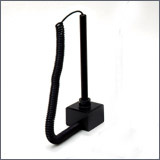 Standard 23in cable supplied with both round and cube base Sentry Pen. 8in flexible coil extends to more than 5 feet and is supplied on cube base only.